The imaging technology produces real time images with small instruments and can also be used to therapeutically treat numerous medical conditions. Because the procedures are minimally invasive, they require less or no anesthesia and have much shorter recover times. In addition, the precision allowed with real time imaging allows for much less damage to surrounding tissues. There are a variety of pain management procedures using Interventional Radiology and include techniques such as injecting pain relieving or anti-inflammatory medications into local areas or heat-based therapy (using heated needles to interrupt a nerve's ability to send pain signal). A wide range of conditions can be treated including low back pain, pelvic pain, pain in major joints and pain from cancer. Using X-ray or CT imaging, the radiologist can administer the medication or treatment with great precision and without causing new discomfort. 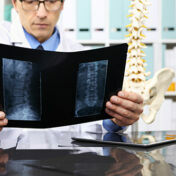 Vertebroplasty is an outpatient minimally invasive procedure where an x-ray camera is used to guide bone cement through a hollow needle into a fractured vertebra (back bone) in order strengthen the vertebra. This can relieve severe pain for patients with vertebral compression fractures (VCF), can reduce the need for pain medication and increase mobility. Because it is minimally invasive it requires only local anesthesia and light sedation and patients can typically go home the same day. 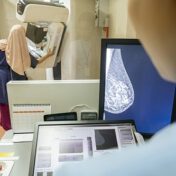 Cryoablation involves creating an ice ball though a small tube guided by ultrasound, CT or MR imaging in order to freeze and destroy diseased breast tissue. As with all interventional radiology procedures, cryoablation is less invasive than surgery, and it is a very safe and effective way to treat breast disease. It is done in an outpatient setting and takes only an hour or two. 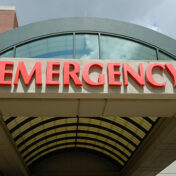 Recovery time is very minimal and patients report very little or no pain. PAE is a relatively painless outpatient procedure for men suffering from prostate enlargement (benign prostatic hyperplasia, BPH). BPH is very common in men over 50 years old and involves such symptoms as poor urinary flow, sudden urge to urinate, and frequent urination. Under moderate sedation, a thin catheter is inserted into a femoral (groin) or radial (arm) artery to access the arteries on both sides of the enlarged prostate gland. From there, the prostate arteries are blocked in order to decrease blood flow to the prostate. This allows the prostate to relax and shrink, thereby relieving symptoms. Unlike treatment using surgery or medication, PAE has very low risk of side effects, is not performed through the urethra, and has a very short recovery time. 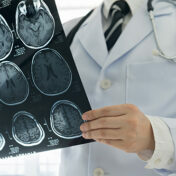 Neurointerventional radiology is where the radiologist uses imaging equipment to visualize the blood vessels in the brain and remove blood clots that are causing a stroke. Because the treatments are endovascular, no surgical incision is made. Neuro endovascular procedures are used diagnose cerebral vascular malformation, brain aneurysm, carotid artery stenosis and treat strokes. As with other Interventional Radiology procedures, because there is no surgery involved, there less pain, less risk and the recovery time is much shorter. Balloon-occluded Transvenous Obliteration (BRTO) and the Transjugular Intrahepatic Portosystemic Shunt (TIPS) are image guided procedures that are used to manage gastric varices (dilated veins in the stomach which can be a life-threatening cause of bleeding in the upper GI tract). Gastric varices are the most common symptoms of portal hypertension. 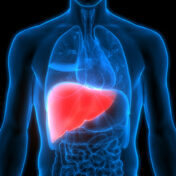 TIPS is a technique that places a shunt in the liver to reduce the portal blood pressure (which will help reduce bleeding from varices). BRTO uses a different approach that involves sclerosing (hardening) the gastric varices in order to reduce bleeding. 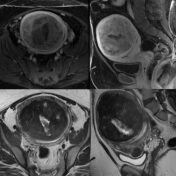 Uterine Fibroid Embolization is a non-surgical, image guided technique used by interventional radiologists to treat uterine fibroids. A thin catheter is inserted into a tiny incision in the artery of the upper thigh or the wrist and guided by x-ray video into the uterine artery where micro particles are injected to embolize, or block, the blood flow. The reduced blood flow to the fibroids will cause them to shrink. Most women will experience significant relief of symptoms within a couple weeks. One advantage of this technique is that it preserves the uterus, ovaries and cervix. Another advantage is that no surgical incision is needed, so general anesthesia is not required and the recovery time is much quicker. Interventional Radiology procedures are vital in treating and managing traumatized or critically ill patients that come to the ER. They offer precise and effective treatments for several emergent conditions and are often safer and more effective alternatives than surgery. Some techniques used include image guided vasoconstrictive, vasodilation, fibrinolytic and embolic therapies. The following are some examples of emergent conditions that can be treated or managed with IR: massive postoperative bleeding, post traumatic bleeding, acute GI bleeding, deep venous thrombosis, pulmonary embolism, and limb ischemia. Needle biopsies are less invasive than surgical biopsies and do not involve general anesthesia. The procedure is usually completed within an hour, recovery time is brief and patients can quickly return to their usual activities. Thanks to modern technology, cancers that once required surgical removal or chemotherapy can now be treated with Interventional Radiology using procedures that only require small incisions. There are several types of treatments available for primary and metastatic cancers in various body organs, including the liver, lung, bone, kidney, prostate, breast and pancreas. 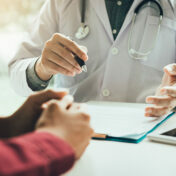 The procedures can used for diagnostic purposes, e.g., obtaining tissue samples to diagnose suspicious growths, as well as for therapeutic purposes, e.g., curing or palliative care (treating symptoms and side effects of the cancer to reduce pain). Therapeutic procedures include ablation techniques that destroy abnormal tissue growth by delivering either “cold” (cryoablation) or “heat” (microwave, focused ultrasound or laser energy), as well as embolization techniques combined with radiation or chemotherapy in particles that block the blood vessels feeding the tumor thereby destroying it. Dialysis is a therapy used for patients whose kidneys are not functioning properly and involves a machine that removes blood from the body, cleanses it of waste and then returns it back to the body. In order to gain access to the patient’s blood system and create an easy to access portal, the Interventional Radiologist will make a small incision in the lower neck and guide a catheter into a large central vein in the chest. 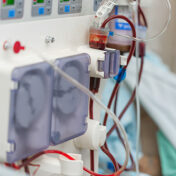 Fistulas and grafts placed in blood vessels are other types of dialysis access. Interventional Radiologists are also involved with the maintenance of dialysis catheters, fistulas and grafts to make sure complications such as clots, infections or scars don’t develop and the lines stay clear. Zia Diagnostic Imaging provides diagnostic imaging interpretation services and interventional radiology services through our partner facilities for your radiology and imaging needs. Our physicians are all board certified and provide professional interpretation of radiology studies with expertise in MRI, CT, mammography, nuclear Imaging (including PET/CT), ultrasound and more.